This is taken from slide 21 of Ecma’s “Standards @ Internet Speed” presentation (22 June 2007 version) which you can download here. It appears to be a sales pitch. I’ve joked about the Ecma process before, but I never thought I’d see it written out officially like this. Standards are made available “on time”? Minimize the “risk” of changes? I thought the whole purpose of technical review was to find the problems and fix them? As always, the man who pays the piper calls the tune. Holy crap, that’s a showstopper if I’ve ever seen one. Or maybe a jaw-dropper. So now we know it: ECMA is by no way an standards body, it is just a company whose mission is to force-feed into TRUE standard bodies (like ISO or ANSI) anything ECMA’s customers want to pay for. What is there to add? ECMA has just shot itself in the foot, with the biggest fire-arm in Doom’s armoury. That must hurt. Ecma is responsible for some of the worlds best known ICT standards originating from industry sources, including javascipt and the cd-rom filesystem. You say, “Ecma is responsible for…” I don’t agree. I think it is more like garbage-in/garbage-out. 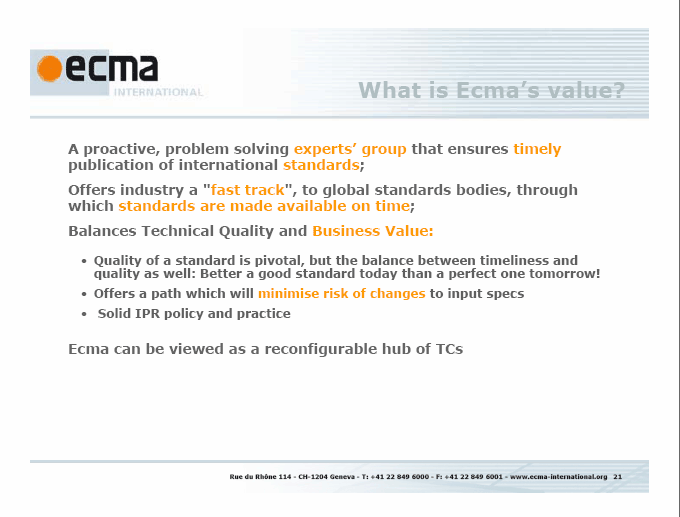 The value Ecma brings is not top notch technical or IP review. Their value, as stated in their slides, is their no-questions asked, low risk, rubber stamp, fast track processing into ISO. Certainly if a company submits a high quality standard initially, it will be unharmed by the Ecma process. But if you send in some half-baked error-ridden specification, Ecma certainly is not going tell you to slow down and fix things. So I wouldn’t want people to get the impression that Ecma makes standards bad. They don’t. But they do allow mediocre standards to pass through, and that lack of quality control risks tainting the whole organization. Bleh, even if they did give us such amazing standards as ECMAScript, DVD+R-R-RW+RW etc, doesnt’t mean they’re not rotten at the root. I really do hope ISO, and other bodies ECMA fast-tracks standards to, review their contracts with this “standards” body, and consider revoking them. I also hope that Ecma regains some self-respect and begins putting its standards through a thorough review. Otherwise, their imprimatur will be as valuable as a degree from a diploma mill. All you ever have is your name. If you soil that, you’re finished. Thanks for posting this, Rob. There are several organizations that accept work from elsewhere, and dangle the prospect that the work could eventually be submitted to ISO via the organization’s relationship, but I haven’t seen anything quite so blatantly advertised as “straight through processing”. Your additional comment about slide 16 puzzles me, though. Ecma does not assess the validity of patent claims, do patent searches, or define RAND terms. I don’t know of any standards organizations that do any of these things. The rest of the points on the slide as well; this looks pretty much normal to me. Hi Karl, thanks for the note. The thing that caught my eye on slide 16 was this: “If, in very rare cases, patent holders are not prepared to grant RAND terms, there are several options…” And they then go on to suggest that disputing the “essentiality” of a patent is one way to get around RAND. Of course, in other standards bodies a corporation could certainly make that claim as well. But I wasn’t prepared to see this suggestion come directly from the SDO as a way of avoiding giving RAND terms. Just wanted to call attention to the comments being prepared for BSI. Excellent source. I love the http://www.contoso.com reference. Did Microsoft think no-one would read the standard in depth? It is really sad, that such an organization [ECMA] is allowed to fast track proposals to standards commitees. So, yes, it is exactly as you ‘ranted’ before on ECMA. Doesn’t this makes the whole standardization process pretty ‘valueless’.